3000 SqFt. 3 huge bedrooms and loft, 2 1/2 Baths, sleeps 12+. 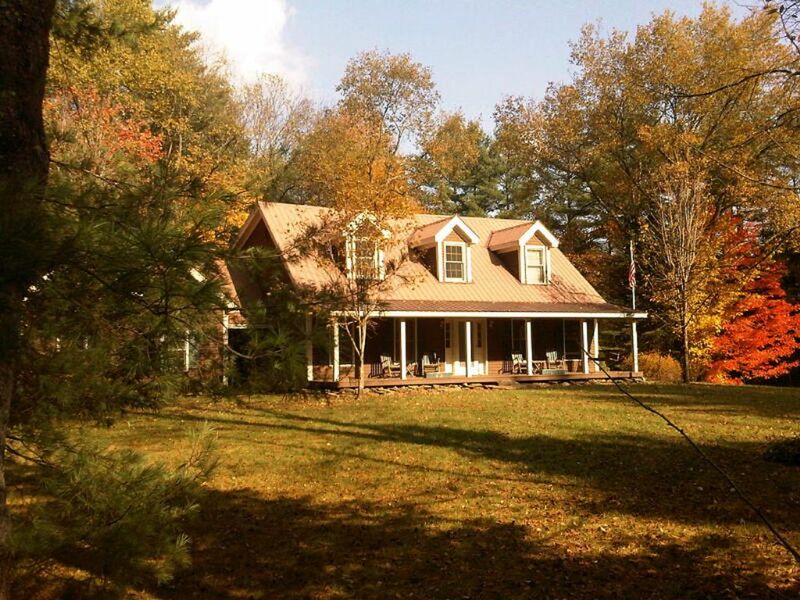 Beautifully decorated, warm spacious home for a perfect Vermont vacation. Huge front yard on quiet cul-de-sac. Walk to town of Londonderry farmers market. Fully stocked kitchen and dining room ready for special Vermont country dinners. Pellet stove in dining room. Near Stratton,Bromley,Magic. X-Country skiing. Ping Pong in garage with heater. Playstation and lots of games for kids. Outdoor firepit. Gas BBQ.Located on private cul-de-sac. Relax on front porch and rear deck. Minutes to Manchester for Outlet Shopping. Perfect for 2-3 families. House fully stocked for a vermont country 'home feel' and ready for families/friends to enjoy. Home is fully stocked with fun things for family and friends to enjoy : Ping Pong table, Ivory chess set, SONY Playstation with lots of games, board games, books, DVD's, lawn games (Badminton, Croquet). Much more. Window air conditioners in bedrooms and loft for the summer months. Great family New Years weekend!!!! We stayed there for our annual New Years ski vacation. Our group of 10 plus 2 dogs had a great stay! This beautiful house was comfortable, clean, had plenty of room with a well stocked kitchen, we made dinner every night!! There is a loft upstairs where 4 kids were sleeping and they loved it cause they had their little own space. The open space living room has a fireplace and plenty of books and games to play. There is a ping pong table and sleds in the garage which we used every day. The location can't be beat ... 15 minutes away from the Stratton and 20 minutes to Okemo. Highly recommended because the owners Gloria and David are extremely friendly and easy to deal with, they provided all the information you could ever need like their favorite restaurants or shopping places. We went to Vermont Country Store and it was lovely. We plan on coming again next year! A belated thank you Joanna. We are so happy you and your family enjoyed your stay. Hope to host you again next year. Warm Regards, Dave & Gloria Russo. Well-maintained, well stocked, organized for families. This home is perfect for an extended family. we enjoyed cooking and spending time at the home playing games or watching TV. Everyone had their own private space. The common space is large enough for everyone together and feel comfortable. The house was well labeled to make using, super easy. Love love love this property! The house reflexes the love the family has for it. Highly recommend. Great family house! Lots of room and nice large gathering areas for meals and relaxing. This is a great place for a group of college students, with plenty of room for 12 people. I gave it a rating of three, because it needs to be upgraded and cleaned if it is to get a 5 from mature adults who like an environment which is kept up to a higher standard at the price off season. Thank you for your feedback Jeanne. We do have a relatively new cleaning service, and will absolutely work with them to continue to improve. We have had many other adults guests stay and were very happy with the cleanliness and overall condition of the home. We are sorry that you were not completely satisfied, and thank you again for selecting our home. Sincerely, Dave & Gloria Russo. Londonderry is very convenient to shopping and restaurants. Many hiking trails and Lowell Lake. Hapgood Pond for swimming and picnicking.Long walks and bike rides. Saturday morning farmers market is right down the road. For skiing all 3 Mountains Stratton. Bromley and Magic are 5-15 minutes from the house.